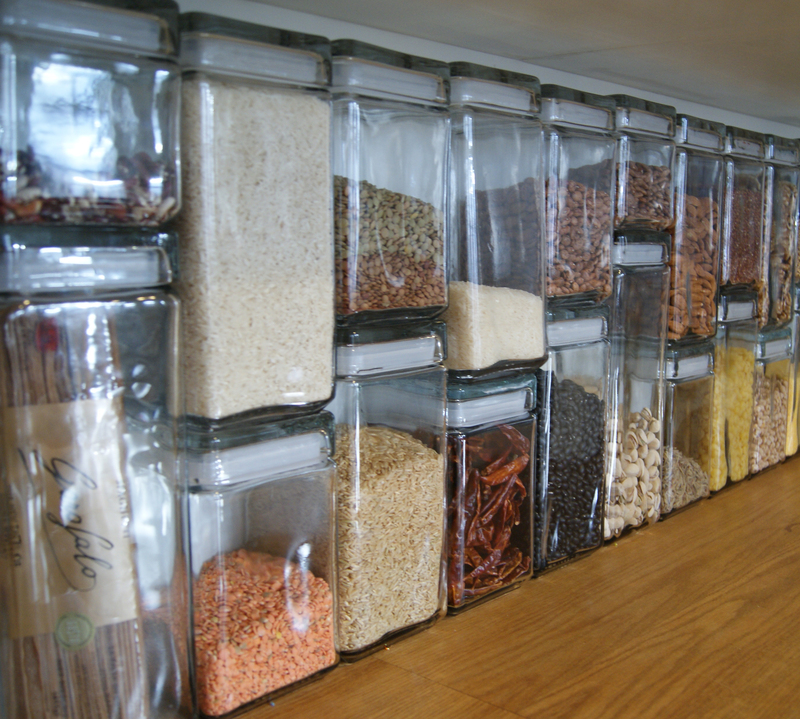 It was exciting to have our “dry goods library” featured on Apartment Therapy yesterday! Most fascinating were the comments on the project: would the light degrade the food inside? Would the jars get dirty? Why the heck did you take the doors off of your cabinets? To clarify: the shelf is part of a built-in that never had doors and is in the dining area just off of our tiny galley kitchen. Since we get almost no direct light in our living room (sigh), I’m not so worried about the food degrading due to being stored in glass. Overall, the project has been a success because we can see everything in our pantry and it has inspired us to use ingredients we had previously forgotten about. Since we cook at least 2 meals a day, we go through a lot of the food quickly, although I’m sure over time we might find that things go bad. But not any worse than when the stuff was stashed in our cupboards. One drawback to the square canisters is the fact that you can’t scoop things out easily because the mouths are not large and they don’t pour all that easily. But I’ll take that trade-off for the extra space this project has given us. I loved the suggestions about painting the cabinets or decorating them with contact paper. Perhaps our next project? In the meantime, I’m working on a post about spice storage (we don’t have spices in this line-up). My friend, Forest, has a gorgeous solution for organizing his spices. Coming soon! This entry was posted on February 17, 2011, 8:47 am and is filed under kitchen, Organize. You can follow any responses to this entry through RSS 2.0. You can leave a response, or trackback from your own site.